Excellent communication skills are essential in today's society, in fact the better you are at Communication the better your quality of life will be. NLP is the most exceptional tool for advanced communication. Every thing about Neuro linguistic programming is designed to improve the way in which we communicate with ourselves and each other. When Richard Bandler and John Grinder Modeled the best communicators at the beginning stages of designing NLP they found the following qualities in each of them. 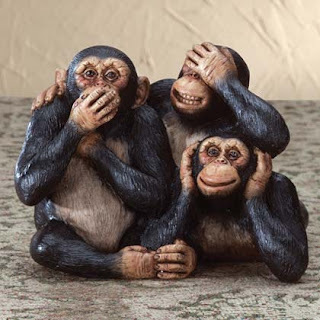 See No Evil |Hear No Evil |Speak no Evil .. unless of course, it is part of your Communication Strategy and is the best way to build Rapport with whomever you are speaking with. Speaking their language always and in all ways. 1, One must be absolutely clear with the outcome and stay focused on it, improving along the way as sensory acuity dictates. 2, The person with the most incredible flexibility wins and can stay in the game the longest, adapting as necessary. 3. The advanced communicator is well managed and is in control of their responses and reactions, knowing how to reset their emotions to neutral states quickly even if caught off guard. 4. They understand the essential importance of Rapport. 5. They control the frame, they design the states in other people to move in the direction of the desired outcome. 6. They stay focused and are disciplined in their processes, even if it does not seem so. 7. They view a Challenge as something exciting and strive to enjoy all challenges. 8. They have a flexible and positive attitude. 9. They live by the presupposition, the meaning of my communication is the response I am getting. 10. They are persistent and always have an association to the outcome no matter what it looks like, they are absolutely certain they will achieve their Goal. How many of these skills do you currently posses and what are you doing to improve them ?